Perhaps it is still too early for Mate 30 news. After all, the Mate 20 Pro was announced just this past October so we won’t expect it to be released at least until next fall. But since we’re on the topic of it, a new report surfaced with renders of a case for a smartphone that Huawei has patented. This case was patented by Huawei with the CNIPA (China National Intellectual Property Administration) and the published renders first became public on January 1 (first reported by Mobielkopen). It is believed this case isn’t for the upcoming P-series flagship that Huawei usually announces during H1, but more possibly for the next Mate-series device which won’t be announced until sometime in H2. We couldn’t even make the argument that this is actually a P-series case because Huawei puts the cameras in the corner for the P-series, but centers them for the Mate series. There are a couple of peculiar things about these renders. The first and most obvious one is how much larger the opening is than on the Mate 20 Pro. When compared to the initial renders of the Mate 20 Pro’s case from the same source, the camera window is the same width but definitely taller than the Mate 20 Pro’s. This leads to speculation of Huawei using this extra space for a five-camera setup. The other thing that has us scratching our heads is the cutout at the top of the phone. While anyone might guess that this round opening is for a headphone jack, we know that Huawei doesn’t equip its Mate or P series flagships with the slowly decaying port. However, the Mate series has had an IR blaster in the last several iterations which leads us to believe this is the round cutout’s purpose -either that or Huawei has something else up its sleeve. 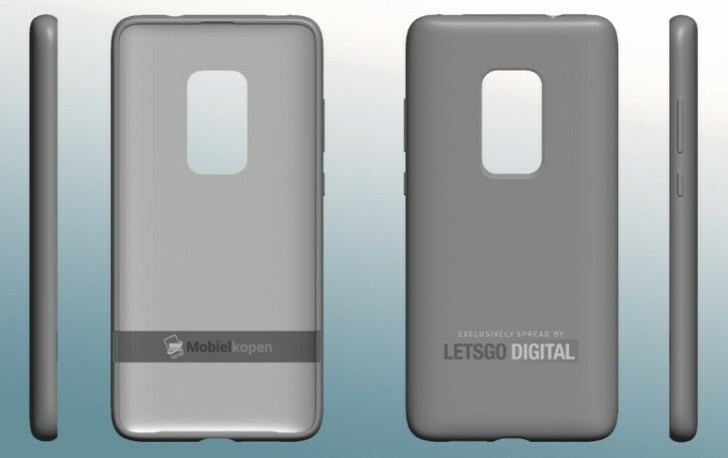 One last thing we can tell from these renders are the subtle cutout at the forehead of the case. This tiny clip-out is for a slotted in-call speaker, which leads us to believe that the Mate 30 Pro will likely have a camera hole in the display. The other speculation is a dew-drop notch, but the former seems more in line with upcoming smartphone trends. Sooner than the Mate 30, we’re looking forward to the P30 to be announced by Huawei. Currently, rumors say the P30 Pro will have four cameras arranged in a row like the P20 Pro. A recent Sony sensor leak of the IMX607 will supposedly be used for this phone as well. Finally, the P30 Pro might use a dew-drop notch unlike the P20 Pro’s wide one.